Sgt Major Lovell, I am the author of the blog post you reference in your email to 3/2. I am indeed a former enlisted US Marine Sgt. and also a former US Naval Officer. Instead of ‘disgruntled Former Marine’ you can call me “Sir” as you would have when I served….I served honorably as an Infantry Marine, Scout/Sniper, and Reconnaissance Marine and was discharged on a disability. I am certainly not ‘disgruntled’. In fact, I earned my own Combat Action Ribbon as a sniper long before you claimed to have earned your own. I am certainly more than a “blogger” Please read my bio and my DD214. If that does not convince you, you can read some of my articles in National Review, The Counter Terrorist, SC Magazine and others. Or you can listen to my interviews on NPR, NewsMax and other outlets. Additionally, I have worked with numerous charitable organizations to help Marines and others. Upon becoming aware of your recent statements, I have decided to post your very self serving ‘apology’ for the world to read. After publication of my story, I invited you, the USMC, and anyone else who questioned my story to contact me directly. 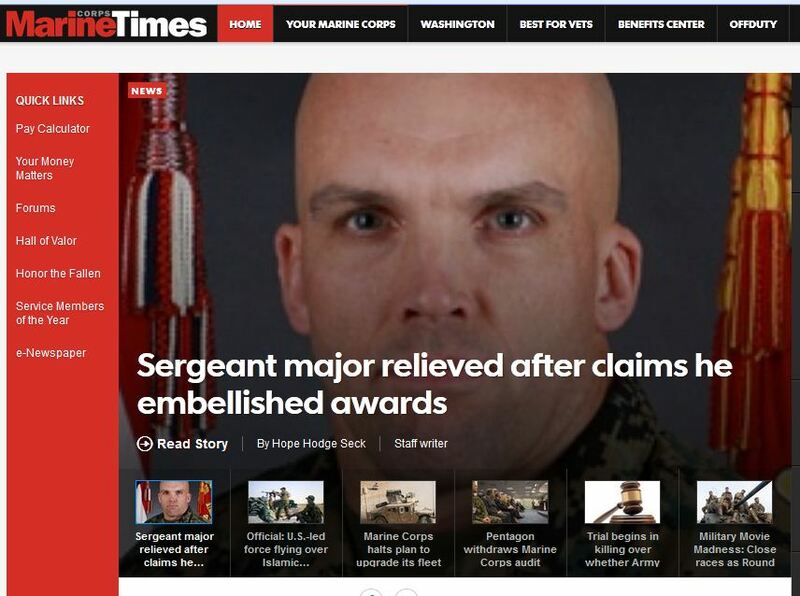 You did not, the USMC did not and instead, you published an apology attempting to discredit me as a simple blogger and disgruntled former Marine. Today I received an email from a Marine who had taken me to task for the blog post. He vigorously defended YOU only to find you had lied. His opening statement to me was telling of his own character and the contrast with your statement is clear. It said: “When a good man is wrong, a good man will admit it. I was wrong,…” Instead of owning up to your actions, you continue to try to blame others. I can only thank God that I never had the misfortune of serving under you while I was an enlisted Marine. I have heard numerous stories and your ‘apology’ below simply demonstrates the accuracy of those stories. You failed to mention to “your” Marines that you had been contacted about the inconsistencies in your story and given the opportunity to correct said inconsistencies. You did not and I posted my article. If you would like to contact me, I am easy to find. Here is the email from Sgt. Major Lovell to the Marines of 3/2. “I want to apologize up front for how impersonal this email is, but with the Battalion spread to the winds across the planet and the very short turn I’m on, I just didn’t have the means or time to address you all in person. Many, if not all, have heard of the attack on my reputation via social media. Specifically, a former disgruntled Marine took shots at me by grossly misinterpreting my biography from Facebook to a blog site. I didn’t make it hard for them by being lazy in my attention to detail to ensure that all ribbon racks and documentation I possessed were all 100% accurate. As such, I allowed myself to have some info out there that is correct, and some that is not. Because of this, 4th Marine Regiment has lost trust and confidence in me to continue to serve as your SgtMaj, and I have been relieved and will leave island today.